From the award-winning Sleep Sheep & Friends Collection, this adorable travel companion brings its comforting sleep time sounds with you when you are away from home. Similar to the Original Sleep Sheep, this compact version (8 inches tall), has four soothing sounds to help your child sleep easier. Soothe your child into a restful, relaxing nap or night of sleep with the Sleep Sheep from Cloud b. This soft, adorable and compact sleep time pal plays calming sounds and is great for home or on-the-go use--anywhere baby needs a little extra help drifting into dreams. Winner of several industry awards, including the National Parenting Council's Seal of Approval and the iParenting Media Award, the Sleep Sheep is plush and very cuddly, so it immediately gives a restless child something pleasing and calming to hold on to. It also creates a tranquil environment with four soothing nature sounds, including gentle stream, spring showers, ocean waves and harmonious whale sounds, making the Sleep Sheep a kind of audio pacifier that helps take some of the stress and crankiness out of rest time. The Sleep Sheep is specially designed to be easy to take with you on outdoor excursions or car trips. It comes with a Velcro strap that allows for fast and simple attachment to car seats and strollers. As you drive or push baby through the grocery store, he'll be able to take a breather. And because he's relaxed, you can focus on task at hand, which makes running errands more productive. 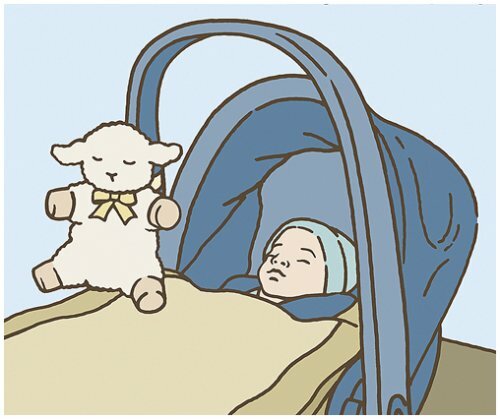 The Sleep Sheep features user-friendly operation that both big and little hands can handle. Select sounds by simply pressing the push button, and then choose the most comfortable volume. For added convenience and to save battery power, the sounds automatically time out after either 23 or 45 minutes--giving your little one plenty of time to drift off to dreamland. Compact and portable, the Sleep Sheep stands eight inches tall and takes two "AA" batteries (included). 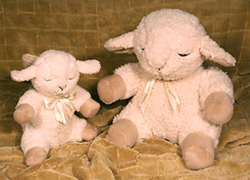 The sound box removes if your child simply wants to use the Sleep Sheep as a stuffed toy, and clean-up is a snap--just wipe the surface with soap and water. One Sleep Sheep and two "AA" batteries. Cuddly plush toy that provides soothing sounds. Built-in Velcro strap for easy attachment to strollers and car seats. Timer shuts off the sound after either 23 or 45 minutes. Shown together with larger Sleep Sheep. I had my doubts at first because it didn't have the heartbeat sound that I thought we needed to help calm our 1 month old. She was displaying what seemed like a mild case of colic (getting fussy/upset only at nights). After researching online and looking at various books (esp the happiest baby on the block). I learned about the 5 S's. One of which was to shush her or have "white noise" which emulates the sounds of rushing fluids when they are still in the womb. I also read this several places online. I was so glad to have found this info as it not only worked perfectly, but meant that I could get this item after all! See I really wanted it in the first place because of its small size. It meant that we could carry it around with us inside the house. My wife and I pretty much take turns with baby. This means that most of the time we are in one of several rooms in the house, i.e. living room, kitchen, computer room etc. With it's small size it meant it would be easy to move about the house with baby, paci, etc in tow. It's even got a cool loop so you can dangle it from a finger while rocking/holding baby, or if your moving to another room or going upstairs to retire for the night. However the size wasn't the 1st reason we were looking into it, it was actually the sounds, a calming affect we wanted/needed. We are so glad we purchased it after reading about the white noise, as a heartbeat wouldn't have worked since it's intermittent and not a constant "sssssssshhhhhhhhh" sound. we use the ocean sound the most and set the volume to match babies volume :D The white noise affect from the ocean not only helps to calm the baby, but I tell you what, it also helps to calm me down!! esp. if you have what might be a colicy baby. I had no idea and hadnt even considered that as a reason or need! After realizing it also had a soothing affect on me as well, I really loved it. (we've read that a baby can also sense your frustration?!). Maybe I should consider one for work, lol. All in All, I had to give it 5 stars, whoever wrote the other review was way off! The auto-switch off with two settings is NO big deal at all. There's a 25 and 45 minute switch which helps so that you are going out a spending cash on batteries every month. If the sound stops, ya just push the sound button again, duh. Chances are it's either right there on you or within arms reach anyways. Long story short, If you've got a colic baby or just one that gets a tad fussy at night (when your already tired yourself) This really is an awesome tool... for both of you. Get this little critter for your little one! Even better than the full sized Sleep Sheep! This mini Sleep Sheep is just darling! I bought it for my daughter so she would have one like her brother's but I liked the idea of a smaller one so it would take up less room in the crib than the original one had. It is really cute. I like the sounds on it a lot better too. No more heartbeat sound, it has been replaced by a babbling brook which I prefer so much better since the heart on the full model never sounded quite right in my opinion. This item is a must! Didn't last longer than 6 months. Edit: CS came through! We purchased our On the Go Sleep Sheep in mid-April and have used it for the last 6 months. Overall, we've found it to be great. I like that I can attach it to a stroller or to a crib, as well as the fact that it has sound control and it's no bigger than a regular stuffed toy. Last month, we noticed it'd turn off well before the 45-minute mark and sometimes it'd turn on randomly during the day and play loud static, which was really inconvienent when baby was napping. Now it won't turn on for longer than 30 seconds, even with brand new batteries. We've come to the conclusion the sound module has a short. I'm so disappointed that the product didn't last longer. My sister in law got one of these for my baby who is now two...It has been a constant companion in the car, in her bed - everywhere. I LOVE SLEEP SHEEP! I now buy them for all of my friends having babies. The sleep sheep has it's ups and downs. The down side of this is that, like another user complained about, there is no continuous play mode. There is 23 and 45 minutes only and a vague "middle position that appears to be one of the two. The sound cuts off sharply when it's finished its time-out which is enough to frequently wake up our baby, very frustrating! It would be good to, at least, have a fade-out for the timed sound. The battery life is excellent on this product, I'm still using the original batteries after 2 months of lots of usage, so I can't see why they don't have a continuous setting. I would not buy this product again because of that single flaw. This is the worst music/soothiing toy we have purchased. 39 and I love my Sleep Sheep! When I saw my friend attach her Sleep Sheep On the Go to her daughter's bassinet, I knew I had to have one. 2 months later I still rave about the purchase. CD's and my iPod are great, but Sleep Sheep really works on those nights or mornings when I'm having trouble getting restful sleep. Without having to get out of bed, I simply press the rain sounds button--my favorite setting--and inevitably I fall back asleep. I enjoy it so much, my 11-year-old son wants one! Recently purchased this for our soon to be new grandchild. But, our granddaughter, (17 months) saw it, tried it and refused to part with it. I'll be buying another for the new baby. Essential for a "happiest baby"
I bought this coz my 9 mo was having problems sleeping thru the night. This helps here fall asleep and somewhat stay asleep, but sometimes she wakes up after the 45 min that this runs, so that's the only problem, it would be nice if it could potentially run all the time. Wonderful from the hour she was born! Great product! We took the sheep to day care for my 1-year old and she sleeps much better now. It's loud enough, but small and portable. High Quality, Soothing and Adorable! There are four soundtracks, each of which is a short (perhaps 10 second) clip that repeats. Our son seems to like the whale sounds and the tidal sounds the most. In the first six weeks when he had difficulty sleeping at night, the sleep sheep was fantastic. It really seemed to help him fall asleep, and the sounds were calming enough that they actually put me to sleep! We've never used this "on the go" as he generally sleep just fine in the bassinet of his pram/stroller when out for a stroll, but it was a perfect size in the co-sleeper.